At West Orthodontics, we aim to provide high-quality orthodontic treatments, such as braces and Invisalign, to patients of all ages from the Lansing and DeWitt, MI area. While many patients believe that they’re too old for braces, Dr. Kristine West frequently works with adult patients! You’re never too old to take advantage of the benefits that orthodontics has to offer; in fact, 25 percent of all orthodontic patients are adults. If you’ve ever been interested in braces for adults, now’s a better time than ever! While teeth can absolutely be straightened at any age, there are two differences with adult treatment. The first is that adults have already completed their growth and development of their jaws. This means that changing the actual jaw structure can’t be accomplished with orthodontic appliances the way that it can with a growing child. Also, periodontal disease is much more frequent in adults. This is a big deal because periodontal health plays a major role in orthodontic treatment. If a patient’s gum tissues aren’t healthy, bone loss can occur and weaken the long-term prognosis of the teeth. Because of this issue, gum disease needs to be under control before orthodontic treatment can begin. Traditional Metal Braces – This is the traditional form of orthodontic treatment that you’re probably most familiar with. It’s popular for a reason – it’s a time-tested and effective method for shifting a patient’s teeth. Traditional metal braces feature small metal brackets that are bonded to the front of the teeth with a thin wire that runs through the brackets. Clear Braces – The main difference between clear braces and metal braces is that the brackets in clear braces are made of ceramic, plastic, or a combination of the two. They’re hardly visible, with the exception of the wire that runs through the brackets. 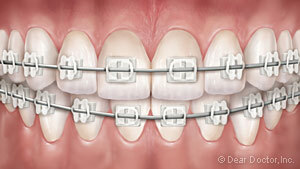 As a negative, clear braces are more susceptible to breaking than metal braces. Clear Aligners (Invisalign) – Instead of using brackets and wires to shift a patient’s teeth, this treatment uses plastic, removable aligners that are created with the help of specialized computer software. You’ll actually get a series of these clear aligners to wear over your teeth; you’ll wear the sets in a designated order for two weeks each. 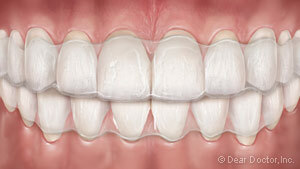 Your teeth will gradually shift as each new set is worn. 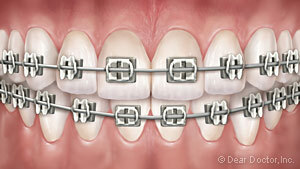 Lingual Braces – These are essentially metal braces that are bonded to the back of your teeth instead of the front. Because they’re on the back of your teeth, they provide the most discreet orthodontic treatment since no one can see them. On the downside, they’re more expensive than traditional braces and they’ll take some time getting used to. 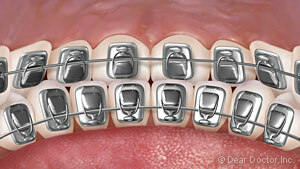 After your orthodontic treatment is complete, you’ll need to wear a retainer. While the orthodontic treatment was meant to move your teeth into place, the retainer is designed to keep your teeth in their new positions. When teeth aren’t held in place by a retainer long enough for the supporting bone to develop around them, they can potentially drift back into their original, crooked positions. Make sure to wear your retainers as instructed so that all your hard work and effort during the treatment doesn’t go to waste. Visit Your Lansing and DeWitt, MI Orthodontist! If you’re looking for adult braces, we encourage you to fill out our appointment request form to schedule a free consultation with Dr. West. Alternatively, you can give us a call at (517) 507-3001. We can’t wait to see you!